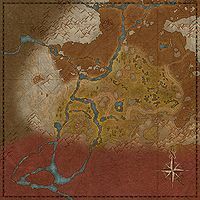 Frostwater Tundra is the southwestern region of Eastmarch. It contains the forts Amol and Mistwatch in the south, and extends as far north as the Bonestrewn Crest. The Frostwater Tundra Dolmen lies in the south, west of Fort Amol. It borders with The Rift to the south, but there is no crossing here. Giant's Run borders on the north and the Icewind Peaks are to the east. These side quests count towards the Eastmarch Adventurer achievement. For Pact storyline quests which also contribute to this achievement, please see Eastmarch Quests. ​ Skald-King's Salvation 5 Save Jorunn the Skald-King at Mistwatch Tower. This page was last modified on 10 May 2017, at 11:57.